An unusual feature of syngonium is that the color and leaf shape change as it matures. 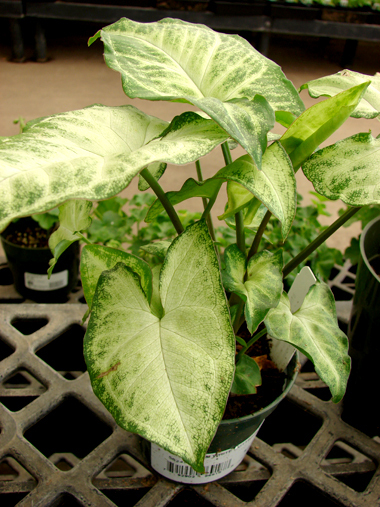 Its young leaves are arrow shaped with pronounced variegation, but as they age the leaves develop multiple lobes and a solid deep green color. Some people train syngonium to climb, others prefer the juvenile form which can be maintained by cutting off the climbing stems as they form. Arrowhead vines require warmth, moist air and bright, indirect light; avoid direct sun. Avoid overwatering: Keep the soil moist, but not wet, in warmer months, allowing the soil to dry out slightly between waterings. Mist regularly with lukewarm water. Optimal temperatures are 65-75° during the day, 60-65° at night. 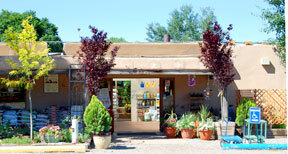 Temperatures should not be below 60° in winter and watering should be reduced. Fertilize twice monthly with a balanced, water soluble plant food. Distinguishing Characteristics: Attractive climbing foliage plant.